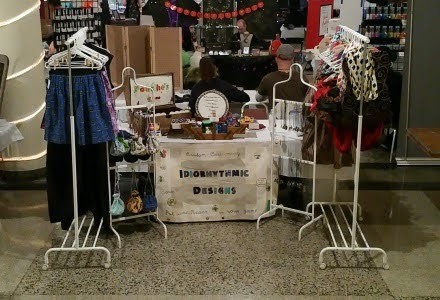 Last weekend I headed over to Madison, WI for the Geek Craft Expo‘s Midwest market. I had heard of the show from crafters I met at the Made in Nerdwaukee event, and it hit all of my buttons, vending wise. Geek Craft Expo is a series of craft fairs around North America which focus on handmade geekery. It’s the sort of craft fair where you find crocheted Yoda ears, dice boxes, fandom inspired bath bombs, and jewelry made out of circuit boards. This was one of the best planned and run events I’ve ever attended. There was a score of volunteers who helped vendors unload. The background music that ran the whole gamut of fandom musical tastes: from “Real Folk Blues” to the Quantum Leap theme music. The room was decorated with standard Halloween fare, there was a scavenger hunt for the kids who came by, as well as trick-or-treating, a make and take, and costume parade. More importantly, for me, was the well-stocked vendor lounge with snacks and bottled water. The last bit was important because I managed to lose my voice for the entire weekend. I had been sick for the week leading up to Geek Craft, yet still managed to drag myself out to vend. I spent most of the weekend behind my table, communicating with customers through notes and pantomime. And to their credit, the people in charge acknowledged the low attendance. When the show closed and people started packing up they made the announcement that future shows would be scheduled well outside of football season. I appreciated their candor. I barely made booth, which means I lost money once I took gas and expenses into account. I am honestly not as upset as I otherwise would be about the low sales. Everything else was so nice about the event, that it sort of washes out in the end. If I end up being in the area when the next expo is planned, I will definitely be signing up to vend. Previous Previous post: Client Spotlight: Sarah G.